I built Harald`s layout of this, a fantastic autowah, I`d recommend sticking this in a bb box with your favourite flavour of fuzz, save yourself the headache of trying to fit this in a smaller box that you`ll probably end up hooking up to a fuzz anyway. Lot of LM13700s just ordered. Have to build this! By the way, any special reason to use LM324 instead of TL074? If I'm not wrong, the original uses two TL072. Sorry mate I missed this question. I can't see any reason why a TL074 wouldn't work fine. What great timing: I just started bread-boarding this circuit this afternoon! I was planning on building Harald's, now I'm spoiled for choice. I'm going to try out the sensitivity pot mod (replace 20k from 220n cap with 47k) since the stock sensitivity pot is a bit touchy, requiring you to set it just a fraction of a hair above minimum for a good response with humbuckers: The 47k should bring this point closer to the centre of the dial. I might also try replacing D4 with a germanium, and the 22u with a 1uF, also supposed to improve the response. Please note for those who find the effect "subtle" that you got the orientation of D4 correct! a 1N34A sometimes has the band on the positive side instead of the negative. double check the polarity of the diodes! I think the 22uF should be 2u2. 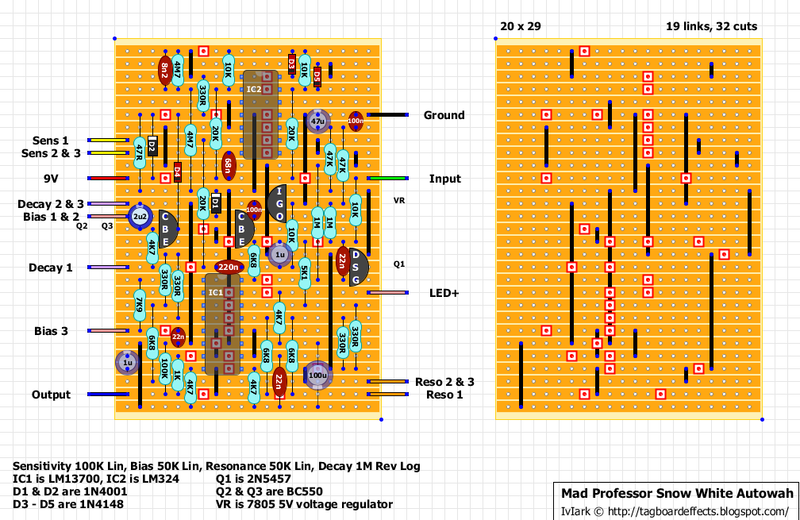 There also seems to be a difference between this layout and the output on the schematic I've got. Here, the 6k8 from pin13 of the OTA goes direct to output, whereas the schematic i've used has this resistor go to pin 8 of the OT, thenceforth through the output cap. Not sure if it would make a functional difference, though. Thanks for the heads up about the cap, the scheme I did it from was quite low res so it could definitely have been a 2u2. And yes you're right about the output, I'll correct it. Any specific flavor of BC550 required? Or, can I flip a 2N5088, without causing any issues? It just said BC550 on the schematic, but knowing Bjorn and bearing in mind some of his other effects, it's probably the BC550C. The 2N5088 would be fine I expect. Did you use the corrected layout mate? I've just gone over it again and can't see anything wrong, will you check the voltages and post those to see if they point to the problem area. Including the transistors. Most of the voltages look good to me, but things look a bit strange around IC2 pins 5 to 7. You're getting 0.04 and 0.05V on the inputs, and 6.41V on the output. 5 should be exactly the same as pin 3 because there's a link attaching them so that definitely can't be right. Check your soldering and look for bridges around there. i put together haralds layout of this cause i didnt have a big enough board for this layout. anyone know how to add an led to this to show the envelope effect? i put one between output and ground of one of the op amps (it would be pin 1 of the tl074 on this layout) and it worked but mudded the sound quite a bit. any ideas? so i replaced D4 with a small, less than 3mm red led and it lights up when playing, seems to work with the decay amount. the only side effect is it gives it a quicker attack. right now i actually have that diode connection going to a dtpt with germanium on one side and the led on the other. i dont know which one i like better. Finished this by modifying the original layout to match the revised one and can't wait until I box it and get to use it on my rig.igjt be one of those that never leaves. Know anything about the bass version? like an idiot, I downloaded the first incorrect vero layout and built it according to that. when it didn't work at all, I checked the page and found the corrected layout, so I had to mod my build to match it. it works and sounds great now. thanks for posting it. Nice one John, thanks for the pics. Was it ok for bass as it or did you mod anything? it perfect for bass just the way it is. (no low end loss). I suppose that MP's bass version might have a slightly lower freq range for the wah circuit but I don't think that it's necessary at all. OK, am I losing my mind (and my eyes) or does this have only 32 cuts? I've been over it a dozen times and I cannot see 33 cuts...? Yes you're right. I do this sometimes when the layout is finished and I've noticed that one of the cuts isn't required, and so remove it but forget to alter the number. Since 2N5457 seems difficult to find, can it be replaced by a BF245C ? Just built this circuit. Is not so horrible as it seems at first sight, but anyway, you'll take a few hours to build this. Sound is f*cking awesome, one of the best autowahs that I've ever listened to. Still far from the Mutron II and the Meatball, but probably, the third better one on my list. Why do you need it solder side up? I never do that unless it's a pcb with mounted pots. Hey guys, I've almost got this one going. The Bias and Reso pots work well but the Sens and Decay pots do nothing. There is no triggering going on. Interestingly when when I remove the 78L05, only the Decay pot seems to be the only pot NOT working. I'll keep looking for mistakes and take voltages if needed. Anyone got any ideas?? Here are my voltages. All pots at Noon. Power supply 9.30v. I forgot to mention that I'm using an A1Meg wired 'backwards' seeing as I didn't have a reverse taper on hand. Not sure what difference it would make. Got it going!! I found a missing link! The controls seem to have a little less range compared to the original, though. Could be just me getting used to them. I'm going to try the resistor and diode mods and see how it sounds. A lot of improvement with those two little mods!! Sounds great now!! Do any diodes need matching (like the Dr. Q type envelope filters)? Just finished building this, but I did not have all the correct IC's, so I used a TL074 and NMJ13600 instead of the specified IC's. So far it does not work, and after some probing with the multimeter I discovered that the power input is extremely low after the first resistor (the 47R after the olarity protection Diode). I'm only getting about 1,5 volts coming out the other end of the resistor (it measures about 8,7 volts before the resistor) and I suspect that this could be the source of my problem, but I also want to check with you guys if using the NMJ13600 is ok for this effect or if the LM13700 is the only option here. Any clues? I will try to replace the resistor to see if it's a faulty one later today. Any input would be very helpful as it seems like I am very close to getting it up and running and I really want this effect on my pedal-board. I also just want to add a big thank you, for all the knowledge I have gained from this website. It has made me learn this stuff way much faster than I expected when successfully putting together my first Electra Overdrive circuit 6 months ago. Just finished putting everything together for this build, and I'm getting sound, but no "auto" wah...I'm stumped! I didn't have 330 ohm resistors, so I used 390 ohms and 2.2k and twisted the ends together to make them more or less one resistor...all of the online calculators said that this would produce 331 ohms of resistance. Did I do this right? I imagine this wouldn't prevent any auto quacking, but I just thought I'd check. If I didn't quite get the connection good on some of the pot lugs (like connecting lugs 2 and 3 or something) would that cause this problem? Also, do I need to match my bc550's? I could see that these could potentially cause the problem of non-auto wah. Do I need to do anything special with the IC's? Sorry for all the questions, I'm totally lost here...I really appreciate any and all help! Measure and post the voltages you're getting at all the IC and transistor pins. That will give us a good clue where the problem lies. Is that something I can do with a multimeter? I've seen the readings on this blog several times but I haven't figured out how to do it...could you show me the light? Do those numbers look OK? Anyone besides me see only 32(thirty two) cuts. Just checkin. The 78L05 is rated at 100mA, the 7805 is 1 amp. They both do the same thing though so you can use the 7805 if it will fit in the space you have. Build this one yesterday. It works great. Nice wah response. Only thing is I get a big volume drop compared to my clean signal. I checked all components for values and they al match the layout. A lot of dodgy voltages there, the supply is low at 7.44 volts (I assume you're using a battery which doesn't seem to have long left, I'd recommend trying it with a fresh battery or even better a power supply), but you seem to have that 7.44V on pin 3, 5, 8, 9 and 12 of IC2 which shouldn't be there, but not on pin 4 which is connected to the supply rail via a link and so should be at the full supply voltage. There is something very wrong with this, so I suggest you start checking placement of the links because you must have put something in a wrong place there. Also check the cut to the left hand side of Q1 drain which could also be the source of your problem. are LM13700'N' and LM13700 the same? Is there any way to add an expression pedal input to this pedal? That 4k7 on the right side of IC1 (upper one), is it LED´s resistor? Use whatever value suits the LEDs you want to use. I recently buildt this one and it is a really great sounding effect for both bass and guitar, without any mods. I have a nice box made for it. Hope to share some pics soon. So I had this built and working great. Then I decided to rebox it with a fuzz. When it was finished, I turned it on and was not working correctly at all. I then noticed I connected the ground and 9v to the wrong places on the fuzz, which was shared with the Snow White. Fixed that, but the Snow White still does not work, but the fuzz works fine now. Is it possible that I fried something on the Snow White? I replaced the LM324, which did not help at all. What should I check? Any ideas? Any of that look suspect? Yes the regulator looks damaged. Your input voltage looks low anyway at only 7.83V, so I'd suggest trying it with a new battery or a power supply so you're closer to 9V, but the output of the regulator should be 5V and you're getting 7.19. Try changing that and see if it fixes it. Okay, I replaced the regulator, and the readings are different, but it still does not work right at all. It wahs a bit with certain settings, but its very week and muffled, dark, etc. I have been using the onespot power supply which I always use, and is supplying about 9.4 volts. Right, with that series protection diode you lose around 0.7V straight away, but I would still expect you to be getting 8V+ from a 9.4V supply. are you sure that the resistor after d2 is 47r and not a 47k? cause that's something i did a few times. that would explain the small volts you get. and if the regulator gets much less than 9 volts, it will never work. it needs at least 3 volts more from what it should deliver. Yeah, this is strange. Supply is giving 9.41v. After the diode, its 8.68. The 47ohm resistor reads 8.68 on one end and 7.07 on the other, which is what the regulator IN also reads. I replaced the resistor, no help. Would any other readings help? When a 100n cap is called for in a small space and you posses 'ceramic' 100n caps. Is it advisable to use the ceramics or are they too inaccurate compared to box caps? The physical advantage being obvious. Hi! Any idea if a BC550B would work? Smallbear has "BC550B" and "BC550CBU". Thanks. One more thing, is there a replacement/sub for the 2N5457? Thanks! Thanks lvlark and Travis for the replies! Where and how should I conect the VR 7805 ? Because in the scheme there is only a trail to plug it and the LM7805 has three "legs". I don't understand what you mean. The layout show all 3 pin connections, input, ground, output. The orientation shown is correct for the ones I have in stock, although I don't know if all regulators use exactly the same pin and body orientation. You'll need to check the datasheets for the ones you have bought. The ask is: Where do I plug the VR 7805 5 V regulator ? What do you think the transistor symbol reading "I-G-O" is? Thank you very much ! Now everything make sense ! I would like to know if someone used LM13600 instead LM13700. I made this research before I ask here, however the majority of the discussions about the LM13xxx IC were not for music or pedal effect. an LM13600 will sound exactly the same as an LM13700. Did you already use the LM13600 instead of LM13700 ? I have wired this up and it seems to work. Although the Decay and the Sens knobs seems very subtle. Nothing seems as pronounced as the original. Is it just me, or is this what it sounds like? We don't have 1N34A here, can I use 1N4148 instead? Hi guys. I have built this, but it doesn't completely work. I have taken some voltage readings. Can anyone please help to show me the light? Looks like there's something really wrong with LM324 Pin 1 (when compared to other published readings here). But I have no clue as to how to debug the problem. I have compared my build against the layout, to the point where I am feeling sick (literally, feel like vomiting). I have taken a long break, it has been 3 days, I have forced myself not to look at my board. I would greatly appreciate if anyone could give me a tip on what to look out for / where to start. I told myself, I will not begin debugging till someone replies me. Else, I'll be staring at the board for hours, ending up feeling stressed. Thanks guys. Hi! Problem described above is the same problem that I have. At the same time I built two veros, and in both cases voltages are OK except Pin 1 on LM234 (0,01 V). When I strum strings on guitar, voltage on Pin1 goes to 6v and back to 0,01V. Does anybody have idea what is the problem? Is it just me, or is this effect very subtle? Ive wired it up and it works, but the Decay and Sens pots are so subtle, it is barely noticeable. The Bias and Res pots seem to work fine. Any thoughts anyone? I built it a while ago and it's definitely NOT subtle at all and it sounds like a real wah-wah as opposed to a envelope pedal. i haven't built this yet, but listening to the video it shouldn't be that subtle. check to make sure you don't have a cold solder joint, and you're getting good voltages at the IC's and transistors. Sweet, ill open it up and have a look, and just double check. Ill post my voltages once im done. Hey guys. I have this working, but there doesn't seem to be as much wah as there should be. All of the controls seem to be changing the tone as they should. It just needs the wah to be deeper. If I play around with the controls, I can get a decent quack, but still not as pronounced as it should be. What part of the circuit should I be experimenting with to add more wah? I built this off of the first schematic and it fired right up. It sounded pretty good but when I swapped diode 4 for the germanium it sounded great. I tried a variety of different gain pickups with it and didn't see a need to change anything else. As always great job guys. hi this Thing Kind of works Kind of not. it doesnt do the quack. it ramps up and down but really slow and subtle. ive measured the voltages and they seem right. maybe pin 1 IC2 and B of Q1/2 are a Little low. It works great!!! Just not that in the instructions for the PCB he has the Decay and Sensitivity labels swapped in the PCB layout picture. The values and locations are correct in the parts list though. It works great and is an easy build. Note that he has the Decay and Sensitivity labels swapped in the PCB picture in the instructions, but the pot values in the parts list is correct. How do I wire the switch? I made this circuit, but it did not work. Well, I can just hear some strange noise. I already changed the ICs and the problem is the same. Can I connect pot legs together in pot side eg. Sensitivy pot 1 > board, 3 > 2 together and leg 2 > board? So do I need 3 wires to board? I just built 2 of these (with mods). One for me and one for my brother who has been hunting for a nice effect to breath some soul into his bass. It sounds sweeter than I thought at first and I love how it responds as you play. Thanks for the layout, this website and the community rocks! I only started building some months ago. This pedal doesn't work here. And i don't understand why. I've check all the componants, their place on the board, everything is good. I needlove your help, maybe something like a «checklist», to find where is my error. From where should i start my search? Sometimes one leg from the IC is unsoldered, or a solder bridge between the vero lines. If you have other ICs to test. Polarity of the capacitors. I just made this one and I´m really in love! Very musical and sounds, if not the same, very very close to the original one. Very musical and vocal, i´m using it instead of my vox wah. I'd like to ask what brand of potentiometers did people use for this? I would like to get all 4 by the same brand, and ideally from the same product range so that they all require the same amount of torque to turn, but I'm struggling to find the reverse log potentiometer. Alpha 16mm pots work great. I think I may have found a mistake. There seem to be two capacitors coming directly off of ground, run in parallel to the input of the one of the opamps in the lm324. This is strange, because a 47u capacitor run in parallel with a 100n capacitor is just the same as a 47.1 u capacitor. I think maybe the 47u cap is supposed to connect to the other end of the 47k resistor, so it's on the same band as the "I" input of the voltage regulator. Please let me know if this is actually a mistake or not: I'd like to know before I start building this! the input of the 78l05 is filtered by the 100uF and arguably you could also add the 100nF here in parallel. ive had the same issue with 2 of these builds using fuzzdogs 7 dwarves pcb. built 3 over the course of a couple years 2 of them did not work right. NOT ENOUGH QUACK. hardly any quack at all. I wish i still had one of them to compare to the one im building now. Do it from here. It works PERFECTLY. Will subbing a 1n5817 or 1n5711 work as well as the 1n34a? I'm assuming the reason for the 1n34a mod is to lower that diode position's forward voltage from 0.7v to 0.3v? Or is there something else about the germanium diode that is needed in this circuit? 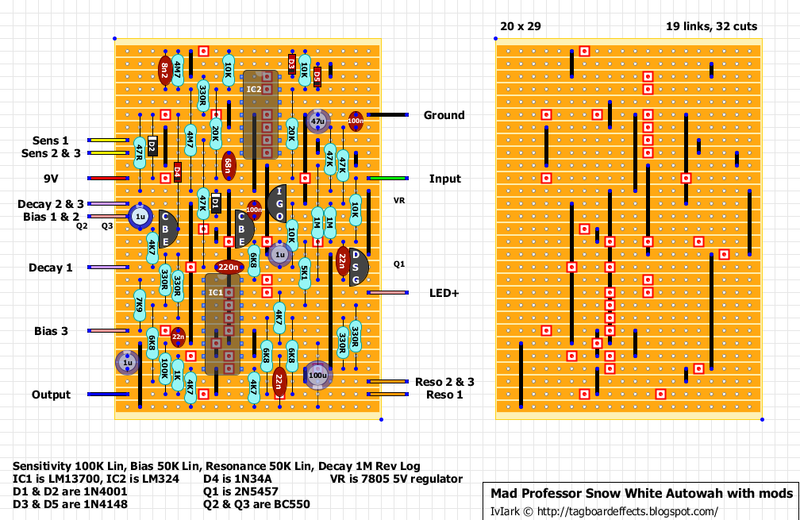 I believe the 10k resistor at the top right of the board, between D3 and D5, should be 20k. If you build it with the 20k then let us know if you have any problems. I followed the layout above twice and they worked fine. I did notice that there are a few different schematics around and have either a 10k or 20k as you mentioned above. I went with the 20k. I assumed 10k would be killing some of the envelope signal. As an after thought, I toggled between 10k and 20k to see if there was any noticeable difference. 20k definitely gives a larger sweep upwards. I also wanted to add a lowpass/bandpass switching option and a little more resonance. First, I added a switch to tap off either pin 8 (normal) or pin 9 (bandpass) for the output. It worked, but the volume drop off pin 9 was not easy to makeup. So scratch that. Then, I lowered the value of the 6k8 between pins 9 and 3. For testing, I just paralleled another 6k8 across that resistor and there was a noticeable bump in both bandpass (and resonance). Not sure how I am going to implement it yet, maybe swap out the 6k8 with a 5k pot in line with a 1k8 resistor, or maybe just a switch with a predetermined resistance change, but seems promising. Hi all. As an amateur, I tried this build. No output through the circuit board. Ok through bypass. I have triple checked components and found a cap and res with wrong values. (how on earth did I get that wrong?) Have scutinised soldering with magnifying glass and tested for bridges. Twice. I have the ic voltages, and pictures handy. Is this the place for troubleshooting support ? Many thanks. Just finished my second one, great as always! The one I built the Decay pot does nothing.